I am addicted to Pier 1 candles and find myself going straight to their candle section as soon as I walk into their store. For me, Pier 1 scents are so unique and hard to resist. 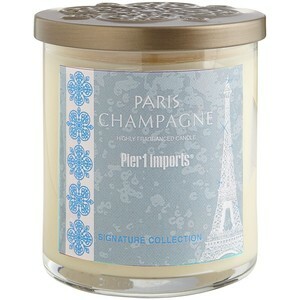 Paris Champagne was from their medallion line and wow did this candle smell good. It kind of reminded me of a sweet floral scent but very sugary and fresh. I absolutely loved it!! Sparkling and sophisticated, this blend of grapefruit, pink champagne, raspberry, French florals, mint and grape leaf promises to fill the room with a lively fragrance. I can’t even begin to tell you how beautiful this fragrance is. Reading that description, what I picked up on the most was French florals, raspberry, pink champagne and maybe teeny hints of grapefruit. It was all blended so perfectly, it was hard pinpointing one element from the other. It’s just one of those scents that makes you smile and sigh deeply when you smell it. Can you tell how much I liked it? Oh my gosh!! So much! Time to light this beautiful candle! I chose a small bathroom to burn this candle in because I really wanted powerful, and I wanted to fully enjoy the aroma from beginning to end. Burning it in a high traffic room did the job and oh my goodness did I love it. Once the wick was lit, it took a good hour to reach a full melt pool but I really started noticing the scent about 15 minutes in. The aroma….. a fresh and bright powdery floral that was definitely more floral but still fruity and sweet if that makes any sense. Let me put it this way… I’m normally not a fan of floral scents but when blended with fruit, it makes it a much more enjoyable aroma. 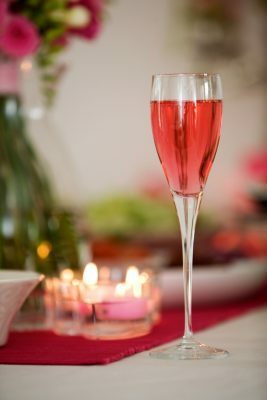 Paris Champagne was a perfect blend of sweet raspberries, smooth champagne and floral. It reminded me of a lovely and soft perfume. I loved it. Strength – on a scale of 1 to 10, I would rate this candle a 6 in a small room. Wouldn’t attempt burning it in anything larger. The aroma was pretty subtle but a perfect strength for a small room. This candle burned great. No wick issues. Clean and even burn from start to finish. I absolutely loved Paris Champagne and plan on purchasing every candle I find from here on out. I don’t see this candle listed online but I have found them in stores so should you run across one and are in the mood for a beautiful and soft floral… buy this candle. It’s so worth it.